Tiger 2015 horoscope promises that the Year of the Green Wood Goat will be a thriving year. This year has a positive influence on the Tiger zodiac sign. Tiger and Ram are highly compatible and this enhances the energy of this Chinese astrology sign. Tiger in 2015 Chinese astrology are always on the lookout for stimulation. They are not afraid of trying out new techniques. Their motivation and hard work guarantee that they will accomplish their tasks. Year 2015 presents Tigers with a plethora of possibilities for establishing new businesses or expanding their present ventures. They will be able to take all opposition in their stride and emerge victorious. Tiger 2015 predictions forecast that they will be able to use their innovative capabilities at their work place. Their hard work will impress their superiors which will bring in financial rewards. Tigers want to have their way in whatever they do and this may result in conflicts with associates and management. Their success depends on their capacity to curb this overbearing attitude. Tiger 2015 Horoscope predicts that when it comes to finance, the Tigers will reap monetary benefits due to their industrious nature. It is advisable that they save money for a better tomorrow. But you can also indulge in buying expensive things to improve your living standards in society. Tigers are affectionate at heart and at the same time they want to control others. The year of the Goat 2015 predictions foretell that they will be able to build alliances with partners who understand and accept their nature. Year of Wood Goat produces powerful emotions in the Tiger. This may induce Tigers to convert their relationships into marriages. 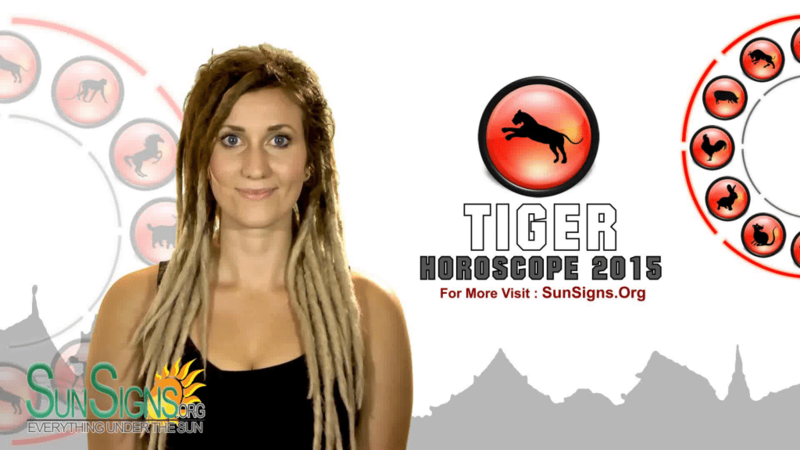 Tiger 2015 Horoscope foretells that this year is favorable for expansion in the family by child-birth or marriages. Family relationships will be harmonious with more get-togethers and celebrations. There are possibilities of turbulence within the family. This is because of the basic character of the Tiger. The 2015 Chinese horoscope suggests that the Tigers should be more charitable. They should avoid any unpleasantness in dealing with such situations. Basic trait of a Tiger is their curiosity to visit new places and to benefit from their visits. This sense of adventure will take them to various destinations either for business or for pleasure in 2015. Tiger 2015 Horoscope forecasts that when it comes to health, you have superb prospects. As far as your physical health is concerned, you have nothing to worry about. In addition you should try to improve your mental health. Tigers are interested in sports and they are particular about how they present themselves in public places. It is necessary for them to be more cheerful in their outlook rather than feel dejected. There will be some rivalry in career and business. But financial predictions for the Tigers are excellent.